Anyone who is running a business must wear several hats. No question, youâ€™re looking totally cool in your asphalt hat, but how do you come across in your salesman hat? Itâ€™s common to feel awkward in the selling situation. In fact, everyone who starts a business is an expert at something other than selling â€“ unless theyâ€™re opening up a sales training company! The rest of us have to drag ourselves away from our first love â€“ the asphalt business â€“ to grapple with sales and marketing. Thereâ€™s hope! If you can master the details of paving, you can certainly learn and apply key basics of marketing that expand your customer base. Marketing is the biggest umbrella. All branding, advertising and public relations fall under this category. The first thing to do is list everything you now do to attract new business. Do you have your company name and phone number on your trucks? Thatâ€™s good advertising and you should be doing that. 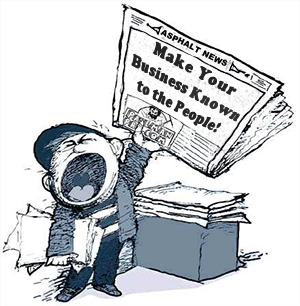 Do you advertise in the yellow pages? 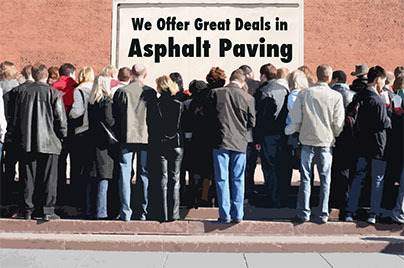 For an asphalt business, thatâ€™s an excellent investment because all your business is local. Do you have a Web site? Do you sponsor any local charitable groups, walks for cures? Do you print flyers? Take prospective customers out for lunch? Even stationery and business cards are a marketing expense. Once you have your list, estimate your annual spending for each item. A rough rule of thumb is that your marketing budget should fall at about three to four percent of your annual gross. This percentage tells you if you are spending enough, or too much on marketing. The next step is to make sure you are getting the most for your marketing dollars. The first, best way to assure this is by branding your business. This is not complicated. All it means is that you have a logo and a color scheme, then make sure that logo and those colors are in and on everything you do. Over time, this builds recognition of your company. The sign on your shop, the signage on your trucks and equipment, your stationery and business cards, as well as any flyers you do should all have this same look. Even your invoices and statements should have the same look. If you make ball caps, T-shirts or coffee mugs, if you have a Web site, if you buy a high school yearbook ad â€“ all should clearly have the same look. This builds recognition and projects stability over time. And, it assures that every time people see something about you, it all hooks up in their mind. You havenâ€™t noticed Coca-Colaâ„¢ messing with their basic logo lately, have you? Thatâ€™s because, over the years, they have built up several zillions of dollars of recognition with that distinctive swirl. It is not necessary to toss everything you are now using and redo all your signs and materials. Since your yellow page contract is probably annual, set your goal to have your consistent look in your next yellow pages ad, then work gradually to change your other materials as your current supplies run out. A logo need not be expensive. There are places on the internet that offer a simple logo design for as little as $100 or so. Just visit your favorite search engine, like Googleâ„¢ or Yahooâ„¢ and search for â€œlogo design.â€ Ask the local high school or college art teacher to make your logo a class assignment. Itâ€™s not rocket science. Once you have established your logo and your look, donâ€™t change them â€“ ever. If you do, you lose all the recognition and stability you have built up. And, changing everything is expensive. Only you can analyze what your competition is doing. Make sure you are where he is, and more importantly, where heâ€™s not â€“ then go there. Community involvement is an excellent strategy to build awareness about your company. This is often more effective in smaller cities where it may be easier to stand out from the crowd. Choose a charity or good cause, for example, and make sure you are a highly visible contributor of your time and participation. When two or three are together, planning the charityâ€™s next event, youâ€™re one of those people. And you get a big banner at the dinner, and half the people in the parade are wearing your logo T-shirt â€“ you get the idea. Go where the people are. If your town has a bustling farmerâ€™s market, set up your card table and hand out â€œ10 percent offâ€ coupons for residential driveways. Join the chamber of commerce, the downtown merchants association, the economic development committee. Incorporate your favorite hobby or interest. If you are a huge football fan, set up an outrageous tailgate display. Tip: Do you know you can cook in hot asphalt? Wrap brats and vegetables in heavy foil, and cook them right in the mix hopper! Set up at local high school or college games. Are you an avid golfer or fisherman? Dream up a contest to sponsor. Buy a used beater pickup truck for $500, and offer it as first prize â€œfishing carâ€ in the first annual ABC Asphalt Fishing Contest. Mount the winning catch in a slab of asphalt. Take pictures. Send them to the newspapers. Stick your nose into the business of those who should be contracting with you. Where are they? Attend their shopping mall association meetings, Keep your eye on the local airport tarmac. Check with homeowners associations; see if you can work out a discount for all the residents of a single neighborhood, or a rate if at least four homeowners on one street agree to repave their driveways all the same day. Make your own news. Add a new product to your list and use it as an excuse to call every potential client in town. We now build tennis courts! We now use recycled tires in our mix! Asphalt is a very environmentally friendly product. It is the largest product recycled in the U.S. It is so safe, it is used around the country to pave water storage reservoirs to hold drinking water. Ask the city if you can install an asphalt water drinking fountain on city property. Just be sure the plaque explains not only the safety of asphalt, but that you are the asphalt expert in town. â€¨ Assure that everyone knows the role you play as an environmentally attuned asphalt contractor. The main idea to having a plan is to make sure youâ€™re not wasting money, and that what you do gets the maximum return. It also helps to spread out your spending throughout the year, and to focus extra funds at key points in the season. Television advertising is very expensive to produce and schedule. Itâ€™s very easy to spend a lot of money to reach a lot people who do not make asphalt purchasing decisions, and may be located too far away even if they did! There may be rare exceptions, but asphalt companies should stay away from TV and radio unless they have multiple locations in the broadcast area and piles of money to waste. If you really want to be on TV, find a local program that covers civic affairs, and plan an educational segment about asphalt. Or, find a talk radio program that covers community development and call in. If you are having a Fishing Contest, make sure to alert the media; they may be eager to feature it on a news program. Just make sure you know what you are going to say, and express yourself in an appealing way. Note to the wise: Most of us are not natural TV personalities. â€¢ If you print flyers, hold down costs by making them time-insensitive. That is, donâ€™t date them or show an expiration date. If your flyers are generic, they will have a long shelf life, and you should be able to use all of them over time. That way, you can eliminate waste, print a higher quantity and get more flyers for your money. â€¢ Because your look and logo are set, it is safe to save money on hats, T-shirts or coffee mugs by ordering in larger quantities that bring down unit costs. â€¢ Be vulgar with your business cards. Order mass quantities. Sprinkle them shamelessly around the community. Place them on every grocery store bulletin board, stack a dozen or so in every restaurant, dry cleaner, barber shop, insurance office and bakery that will allow it. Throw them out of an airplane â€“ not literally, of course, but make sure you always have a couple of dozen in your pocket, and put them everywhere itâ€™s legal to do so. Finally, allocate time each month to make sure you are actually collecting names of prospective customers. When you find yourself in a conversation where you are trading business cards with someone, be sure that data gets recorded somewhere. Worst case, collect them all in one shoebox. Better, type them into a database on your computer that will print them out as labels for a mailing list. Your list of customers is more valuable than your most expensive piece of equipment. Itâ€™s the core of your business. Existing customers and prospective customers are your heartbeat. It is vital for today that you have excellent records of your customers, and urgent that you are constantly working your list of prospects for tomorrow.